Most of us can name something from our past that is so affectively charged, it instantly snaps us back to a certain moment in time. For many people, these somethings are cultural objects: films, television shows, books, songs—the things we consumed stand as markers of the good, the bad, or even the confusing events of the past. For me, most of my time-traveling is instigated by books; as a child, I was much more textual than I was audio-visual. I could easily craft a timeline of which books meant what to me when. I’ve always had an affinity for the written word when it came to English, but as a mixed child growing up in the United States, Japanese became the language that resonated more when I actually heard it. Even now, I find a lot of comfort in overhearing Japanese being spoken on the street, or in simply turning on a Japanese film if I am feeling anxious that day. Japanese media is much more readily available now, which is a huge boon to those of Japanese descent who live outside of Japan, those who want to learn Japanese, or anyone interested in expanding their multimedia horizons. But this ease of access is still relatively new, especially for someone like me, who once relied on the precious few movies shipped over by family once or twice a year. These movies were treasured tokens, because they were the one thread that kept me connected to a key element of my identity. We moved from Japan to the United States when I was about five or six years old, and like many transplanted children, I held on tight to the items I brought with me, in the hopes of grounding myself in a new place. For me, these items were an absurdly large アンパンマン [Anpanman] stuffed toy, and a collection of haphazardly labelled VHS tapes that my mother had dutifully recorded. These were Japanese television shows that my brother and I adored: それいけ！アンパンマン [Soreike! Anpanman]、ウルトラマンキッズ [Ultraman Kids]、ドラえもん [Doraemon]. My favorite part of these old tapes were the other visual fragments: the commercials that my mother had accidentally recorded when she wasn’t fast enough to stop the tape during each commercial break. I can still recall each of these bizarre commercials for foods, goods, and services, most of which were no longer aimed at my young self recently moved to the United States. After a few years of outgrowing the childish content on the old well-rewound tapes, my uncle began sending us new VHSes in the mail. These were movies from an animation company I had never heard of before: Studio Ghibli. I can’t remember if he sent us two movies at once, or if in our enthusiasm we had begged him over the phone to immediately send another, but the first of the Ghibli-affiliated films that I saw was either 風の谷のナウシカ [Nausicaä of the Valley of the Wind] or the ubiquitous となりのトトロ [My Neighbor Totoro]. I remember watching these films a number of times, learning the songs from both—even though the main ‘song’ from Nausicaä was essentially just a melody—and singing along as the young girls on the screen swayed to my off-key lilting. From then on, we received a new VHS each year through the mail, or via relatives who brought them for us whenever they came to visit. Eventually the VHS gave way to the DVD, so my mother brought back a Japanese DVD player after one of her trips, which we dutifully unwrapped and set up each time we wanted to watch one of our Japanese movies. No matter how much of a pain this English-to-Japanese switchover was (trying to memorize which cable went where, the frustration of starting the film and realizing you only have the visuals working, making sure you could actually reconnect the other player once you were done), we did it countless times, watching these movies over and over again. How can I explain what it’s like to listen to a language that is equal parts integral to you and yet so removed from your current life? Like everyone else, I loved the Ghibli movies for the stories, the stunning backgrounds and vivid animation. But, more than the visual aspects, I loved hearing the character’s voices. These VHS tapes represented the residual memories of the time we lived in Japan, the voices and inflections allowed me to connect back to the language and visual imagery of a place I used to know—a place that was suddenly, abruptly, out of reach. More than anything, they reminded me of my family in Japan and they represented my mother. Although there are many pockets of Japanese culture in the United States, we happened to be in a place where there were few Japanese speakers and, because of that, Japanese became the language of the domicile. Back then, there was no global network capable of instantly sending cultural objects through the screen, no streaming service that could conjure up the other part of my world at will. So Japanese collapsed into simply being the code that my mother and I used, the language I used exclusively with the family I saw when I would return to Japan each summer, or when they would come to the US to visit us. As a child, Japanese wasn’t a national language and it wasn’t a language that could encapsulate an entire mode of existence, it was a language that was used in a tight-knit group to create a bubble of belonging, within a place where we felt we didn’t always belong. It was a very self-contained world, and I often didn’t know how to bring this part of my life into my English-speaking world as a child; these two worlds felt too disconnected to be reconciled. Studio Ghibli offered an unexpected reentry into being Japanese in a non-Japanese place. As a child, I was never interested in anime or manga for one reason or another. 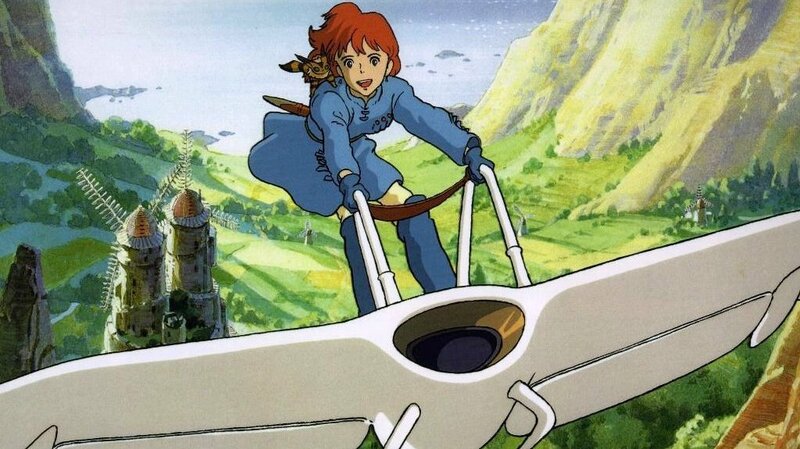 But the Ghibli movies, though technically anime, always occupied a privileged spot in my mind. I absolutely loved them. I remember we invited some of my friends over for a birthday party one year, and my mother set up some snacks, some crafts for us to do, and, on a whim, we put on となりのトトロ [My Neighbor Totoro] as background noise to the celebration. One of my friends commented on it in passing, saying it was cool to hear the movie in Japanese—they had only seen it in English until then. They asked me if I understood it. Feeling a twinge of pride, I said that I could and I even did some rudimentary translation for them, which in hindsight was probably not very accurate. This moment was brief, because our attention, being that of children, was immediately distracted by something else—the cake or the presents or one of the girls showing off their completed art project to the rest of the group. For the others involved, the moment wouldn’t have even coalesced into a scrap of short-term memory, let alone a fleshed-out recollection lasting over a decade. However, this moment became memory for me. It was one of the first experiences where I felt it was interesting to show this part of who I was to people outside the family. Of course my friends knew I was half-Japanese because they knew my mother, and they knew I disappeared for long stretches of time in the summer to go to Japan. Yet this was one of the first times where my Japaneseness began with a shared point of contact. The cartoons housed on our old VHSes, the beloved yet absurdly large アンパンマン stuffed toy that I kept long into my adolescence—these were things that made no sense in the context of the United States. Explaining the basic foundation of these shows back then made me feel crazy and, more often than not, ended with the other person laughing. Eventually though, Studio Ghibli movies trickled into the United States and a lot of the kids I knew at school were familiar with some of them, especially Totoro. This gave us a new commonality to build upon. Even if our takeaways were different or even if they were unsure of what certain images meant, we could still talk about it and that was what mattered to me. The Ghibli movies represent a very specific moment in my life. As someone who once struggled to situate myself in a world that felt dichotomous, at a time when Japan felt so very far away, these movies allowed me to talk about Japan using film as a point of departure. By the time I was in middle and high school, we had the internet readily available, and it was much easier to reach out and touch that part of the world which was once so far. By then, Japan was also considered cool, and people were more than happy to learn Japanese and practice it with me. Even now, I am floored by how much of my childhood—cultural objects that used to be understandable only to a limited number of people with similar backgrounds to mine—is available online. Streaming platforms like Netflix and YouTube allow me to watch old cartoons, new shows, and even classic cinema. Though this access is still predicated on privilege and limited to those who have internet, the fact that there is this much access at all still astounds me. I can even watch current news clips online, which allows me to follow along with what is happening in Japan, as if I am sitting beside my grandfather in his living room, watching the morning news over breakfast. I am still a more textual person in that the majority of my time is spent writing or reading what other people have written. However, I am starting to realize the impact that visual media had on me, especially as a child. The Ghibli movies, in particular, are significant objects in my memory, not only because of the nostalgia that colors all our childhood likes or dislikes, but because they created a space for me to begin unraveling the belief that being half meant being split. For some people who are transplanted or mixed, this was maybe not a significant struggle to overcome. But it took me years to find a way to reconcile the various parts of my identity, that, due to geography and other events happening in my personal life, were always compartmentalized and separate. To have any means of bringing my Japanese side into my American life felt liberating, even if it was as simple an act as putting a 顔なし [No-Face] enamel pin on my backpack and having several peers recognize it with excitement. The Studio Ghibli films, particularly those from the 1990s and early 2000s, have provided a guide for many young people to see themselves. I know many fans who point out how the compelling female heroines, the focus on family, conflict, and internal strength, gave voice to things that already existed within the viewer, but needed some sort of external trigger. The films also often focus on reconciling, or at least addressing, incongruity—characters who feel out of place, characters who are transported to a new world, characters trying to simultaneously overcome internal and external struggles are often the protagonists of the Ghibli films, and the audience joins them on their journey towards triumph. Sometimes the triumph is overcoming a literal antagonist, but oftentimes the real triumph comes from overcoming something within oneself. The characters’ success impacts their external world—as in both もののけ姫 [Princess Mononoke] and 風の谷のナウシカ [Nausicaä of the Valley of the Wind]—but in each case, what resonates is the impact the narrative had on the characters and how they understand themselves better within the context of their respective worlds. Due to the popularity of the Ghibli movies in the United States during my childhood, I was able to imagine a world where I could be both Japanese and American, in a way that didn’t require me to bracket one or the other. For me, that is the greatest legacy of Miyazaki Hayao and his studio, the possibility of creating new worlds—not just in terms of the fantastic or the adventurous—but of creating a space for someone like myself to feel that there was a world made possible for us. Julia Shiota is a Japanese and American writer who work centers on questions of identity formation, nationhood, and modernity through literature. She holds two Master’s degrees, one in English Literature and another in Japanese Studies, both of which provide some key methodological approaches to her essay and fiction work. When she is not writing, you can find her reading or spending quality time with her beloved poodle, Popcorn. Her reflections on literature can be found on this [one] sojourner and in smaller doses on Instagram. Clinton Tham was born and raised in Sabah, Malaysia. He currently resides in Poland, where he is pursuing his Master’s in Architecture. He is also a freelance designer and illustrator who works mainly with watercolour art. His work includes commissioned art, conceptual illustration, character and logo design, architectural design and product graphic design. He believes art represents freedom, art creates itself, and the artist is the medium. You can find him on Instagram, DeviantArt, Society6, Teepublic.